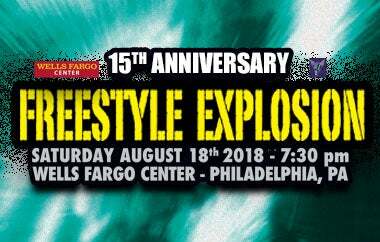 Philadelphia, PA (March 19, 2018) – The biggest names in freestyle music, including multi-platinum recording artist Taylor Dayne, Female Pop Sensation Expose, The King of Freestyle Stevie B., and The Queen of Freestyle Lisa Lisa collaborate to perform their biggest rhythmic dance hits during the 15th Anniversary Freestyle Explosion Concert at Wells Fargo Center on Saturday, August 18. Tickets will go on sale on Friday, March 23 at 10 a.m. exclusively through WellsFargoCenterPhilly.com by phone at 1-800-298-4200 or in person at the Wells Fargo Center box office. The tour also includes family pop group The JETS and R&B groups Nu Shooz and J.J. Fad plus freestyle legends Company B, Debbie Deb, Sweet Sensation with Betty Dee. This lineup influenced the ‘80’s with their style of music which remains widely popular and in rotation with today’s hits. Taylor Dayne’s hits include “Tell It To My Heart,” “I’ll Always Love You” and “Love Will Lead You Back,” which have all been certified Gold in the U.S. by the RIAA. Singer, songwriter and producer Stevie B who was influential in the Latin freestyle music scene of the late 1980’s, is best known for his No. 1 ballad “Because I Love You”. Lisa Lisa rose to fame with certified Gold single, “I Wonder If I Take You Home,” which was released along with her band Cult Jam. American vocal group, Exposé achieved much of their success in the late 80’s and early 90’s when they became the first group to have four Top Ten hits on the Billboard Hot 100 chart from their debut album including their No. 1 single “Seasons Change”. R&B group Nu Shooz fronted by husband-and-wife team of John Smith and Valerie Day scored two major hits on the Billboard Hot 100 in singles “I Can’t Wait” and “Point of No Return”. J.J. Fad became the first female rap group to earn a Grammy nomination. Their debut album and top single “Supersonic” were both certified Gold. Recording Group Company B is best known for their huge crossover single, “Fascinated which reached the top position on the U.S. Dance chart. Debbie Deb gained recognition for her freestyle dance songs such as “Lookout Weekend” and “When I Hear Music”. The Jets is one of the 80’s hottest family bands and has released many albums which include their smash hits “Crush On You”, "You’ve Got It All” and “Make It Real"